Great news!! 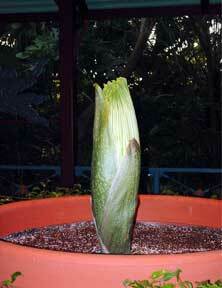 Walt Disney World Horticulture is proud to announce that another titan arum is coming into bloom. Not just any other titan flowering, but a potential world record!! 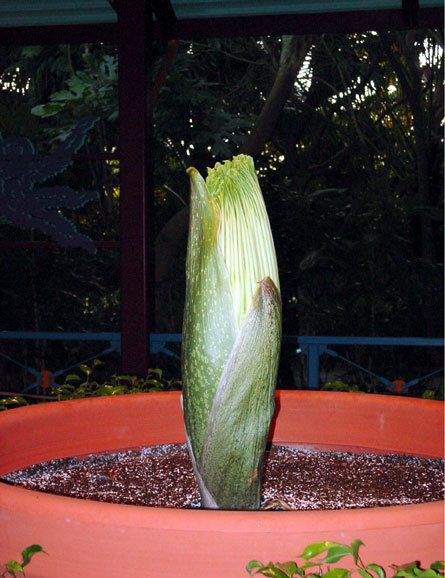 We've been anxiously awaiting the flowering of this plant because it's the largest titan in our collection of 3. 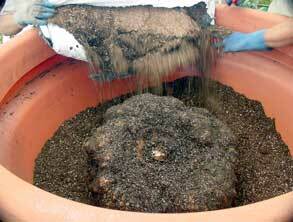 Upon re-potting in June 05 the tuber weighed 134 pounds (61 kg) (see below). That weight is just 38 pounds (17 kg) shy of the tuber weight of the current world record holder at the Botanic Gardens Bonn in Germany. The Bonn titan grew to just shy of 9 ft. (274 cm) in 2003. That feat has nearly been duplicated twice in recent history at the University of Wisconsin-Madison. First in 2001 their titan arum known as Big Bucky reached 8 feet 5 inches (257 cm) and again in 2005 Bucky grew to 82 (249). According to Dr. Mo Fayyaz, Director of UW Botany Greenhouses and Botanical Garden, The potential for flower height isnt completely dependant on tuber weight, genetics play an important role as well. UW-Madison has produced several titan inflorescences and some with greater weight than Bucky produced a smaller inflorescence with identical conditions. This tuber has grown by leaps and bounds in recent history. 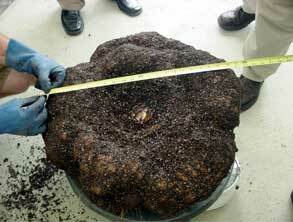 In 2003, the tuber weighed 50 punds (23 kg). Last year the tuber weighed 90 pounds (41 kg) and this year it is 134 pounds (61). The size of this tuber has outgrown all of our nursery containers. A new pot was acquired this year to house the monstrous tuber. The pot is 51 inches (130 cm) across and 42 inches (161 cm) deep and is the equivalent of a 250 gallon (946 l) nursery container. The Titan Arum can be viewed at the Rafikis Planet Watch train station and our best estimate of opening is between September 3rd and 5th. 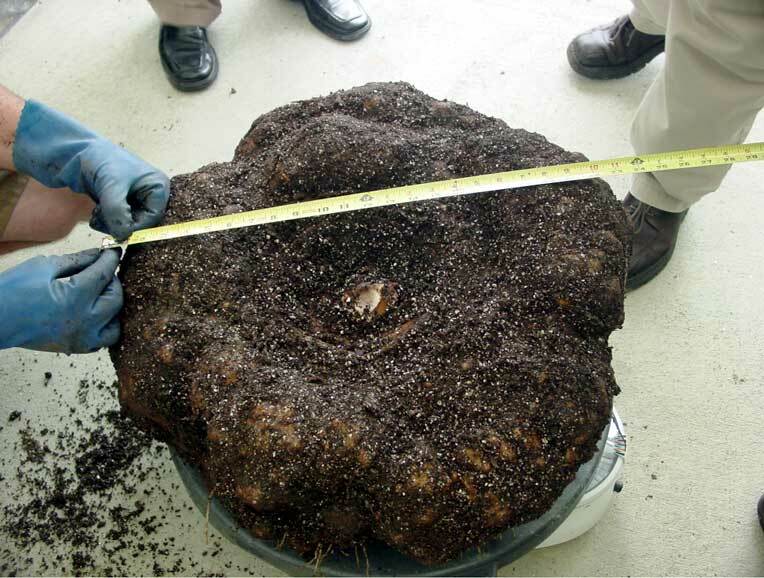 The titan's tuber measured 24 inches (61 cm) in diameter and weighed 134 pounds (61 kg). 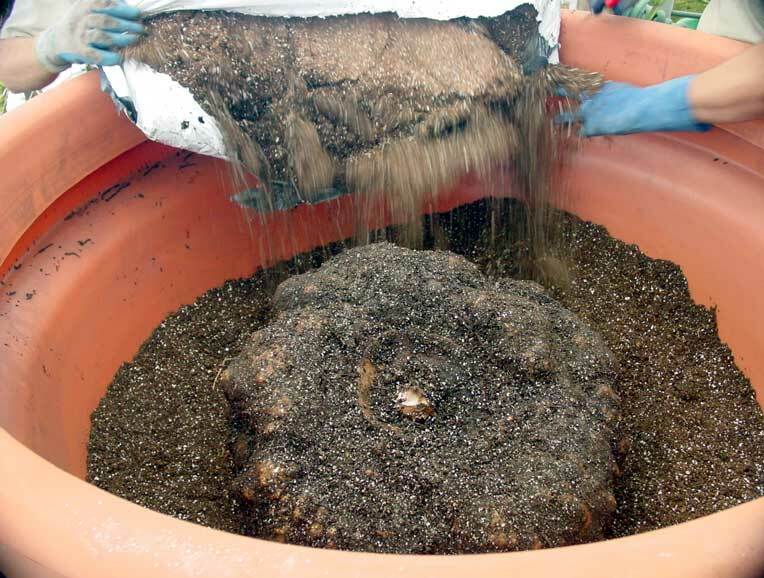 The new pot for the tuber is 51 inches (128 cm) in diameter. This page was created by Scott Hyndman for the I.A.S. on August 29, 2005.